I picked up a 1916 luger holster at an estate sale & this tool was in the holster. At first I thought it was an Imperial tool mark but to my knowledge all Imperial tool marks have a crown. Could this be a Weimar era eagle? Any help would be appreciated. Here is the E/2 Luftwaffe mark for comparison. 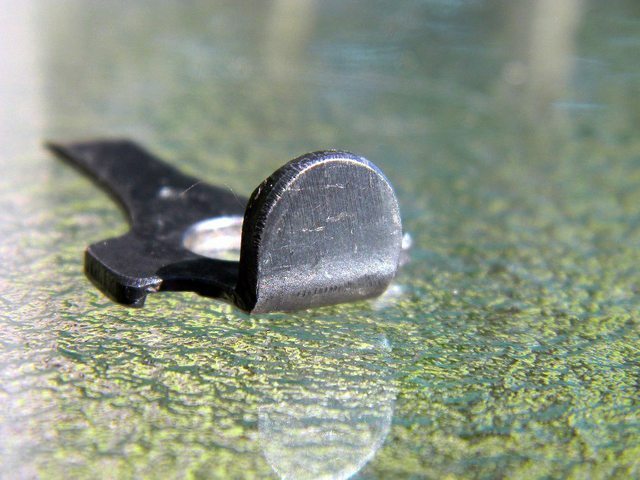 Looks like a Luftwaffe "Eagle 2" accepted loading tool . . commonly referred to as a "Krieghoff" loading tool, based on the marking as well as the color of the blued finish and the overall look of the metal. So-called "Krieghoff" tools are quite distinct in their physical characteristics! Can you post photos of some overall views of the tool (front and back)? Also, close-ups of the top, underside and leading edge of the rounded part where you use your thumb to depress the loader would be very helpful. 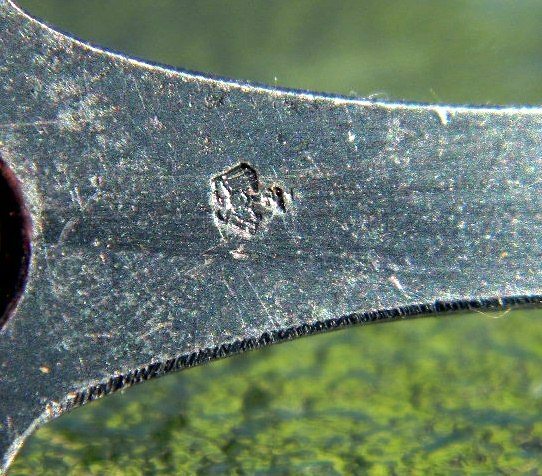 On these Eagle/2 tools there are little serrations found on the protrusion where you place your thumb; these serrations are found only on the Eagle/2 tools. I assume that the most collectors believe the Eagle/2 tools were either made by Krieghoff (or by a sub-contractor that supplied to Krieghoff)? Nonetheless, the couple of these Eagle/2 tools that I have were found in holsters with non-Krieghoff guns . . . which means nothing more than stuff got mixed up wartime and/or by post-war collectors. Thanks for the replies. I took these pics indoors with the flash. If they are not helpful, I will try to take some outside tomorrow. Thanks for your help. I found my Eagle/2 tools; they are markedly different from the one you found in the WWII holster at a flea market. I have included a standard "655" proofed WWII-era tool in the photos, to help illustrate the marked difference in the characteristics of the Eagle/2 tools. 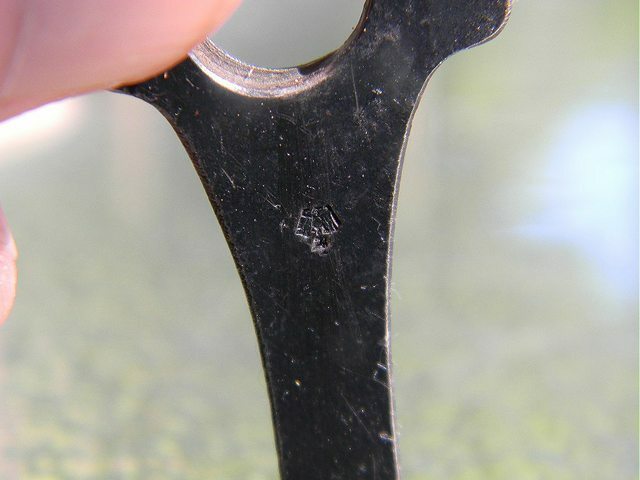 I am far from being an expert, but that one does exhibit some, but not all, of the commonly observed machining markings which are seen on the Krieghoff E/2 loading tools. The Eagle/2 itself is 'crowded' and misshaped when compared to my example above and others pictured on the Luger Gunboards Forum. But it is also common to observe broken dies, mis-strikes, and bounce (double) strikes of the acceptance mark. Last edited by martin08; 12-07-2018 at 10:19 AM. The "655" tool is in this set of photos. Also, to be honest, after reviewing the additional photos you posted, your "flea market" tool looks very different from any known original WWII-era tools that I have examined . . . it has various characteristics that simply don't fit into what I have observed over the years with original P.08 loading tools. Also, the Eagle/2 marking on your tool is different from what I have seen on known original tools. I do not consider myself an expert at Luger loading tools so I'm not offering any conclusions here . . . just observations for discussion. One other idea: You might want to look at the analysis/opinions presented in the "Mauser Parabellum" book by Don Hallock, et al. I have not looked at it in a while, but I believe that it contains a comprehensive treatment of the authors' opinions as to Third Reich-era P.08 loading tools, including the "Krieghoff" Eagle/2 tools. Looking back over Del's photos . . . perhaps the tool is a Weimar-era Eagle/6 tool? 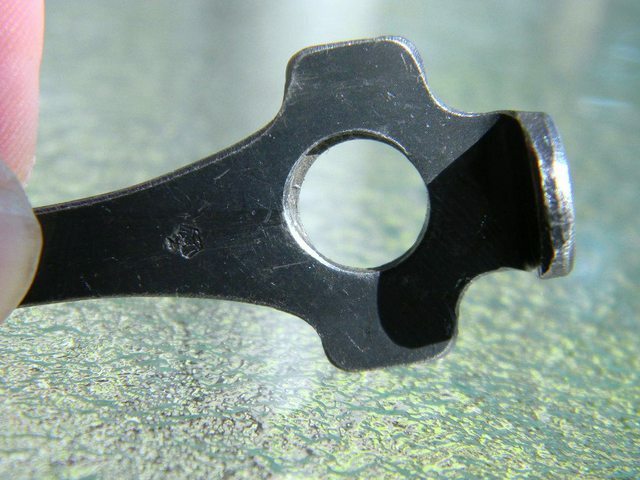 Commonly referred to as a "Simson" tool due to the Eagle/6 inspection stamps found on Simson-produced and/or reworked P.08, Kar 98's, MG 08/15's etc. during the Weimar era. IMO the tool shows obvious signs of age. Plus, given the background information on where he found it, tends (IMO) to suggest that it is not a modern repro/fake. Again, just ideas for discussion. This past Friday evening I spent some time reviewing "The Mauser Parabellum 1930-1946" by Don R. Hallock and Joop van de Kant. The book allows for brief excerpts to be quoted in connection with reviews, which I what I consider this post to be. The book is from 2010 and I've had my copy since that time, but I think the couple of hours I spent reading through it on Friday evening was the first time I've really taken a serious look at it. The book is excellent; I particularly enjoyed the section concerning August Weiss' notebook and recollections re: moving the DWM Parabellum production equipment and unsold parts/inventory to Mauser at Oberndorf and getting production restarted . . . really interesting. Also, the interwar sales records were interesting, particularly the Electric Company of Israel sales. Thus, if you are interested in "Luger" pistols and do not own the book, I strongly recommend that you obtain a copy. As to the tool in question, the following photographic excerpts from the book reveal that, at page 635, the authors have classified this tool as a post-WWII fake. Thank you Alan for the information. I sort of had my suspicions when looking at the tool there was some areas that didn't look right to me. I bought the holster & the tool & a WW2 Mauser clip at an estate sale. The tool & the clip was in the holster.